It is in a version of the slieve donard pattern. This is a lovely Cut Crystal Belfast Bell made in Ireland by Tyrone Crystal. It is stamped underneath with the Tyrone Crystal backstamp. Pair Of Tyrone Crystal Whiskey Glasses . Condition is New. Dispatched with Royal Mail 2nd Class. You can see tyrone label but tyrone writing is not there. THEY BOTH HAVE TYRONE ETCHED ON THE BASE. BOTH COMFORTABLY HOLD 12OZS. These are not flaws but occur as a natural part of the making process. Source : Sourced directly from the trade supplier. The pattern is Dromore, bowl size 6”. In perfect condition. Tyrone Crystal, Bann, Glass Lamp Shade, ~8"
For sale is a Tyrone Crystal glass lamp shade. It is signed indicating first quality. The foundation where the glass attaches to the fixture has a few light scratches. Four peaks of the engraving have fritted off but they are quite hard to detect. 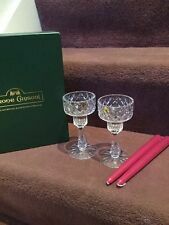 2 gorgeous, crystal, wine goblets made in Co Tyrone by Tyrone Crystal. Each Tullamore pattern glass stands 22cms (almost 9") tall and weighs 450 grams. Complete with original boxes. Signed piece, would grace any table. Made by Tyrone Ireland. The design is OPERA 20 cm in width with very unusal cut outs in the glass. TYRONE IRISH CRYSTAL 5.5 INCH WINDSOR ANNIVERSARY ROUND BOWL BOXED RARE VGC. 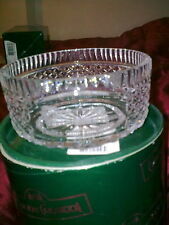 TYRONE IRISH CRYSTAL WINDSOR ANNIVERSARY ROUND BOWL IN ORIGINAL BOX. STAMPED TYRONE CRYSTAL ON BASE. Tyrone Crystal 'SCRABO' VASE - VGC - NO BOX. STAMPED TYRONE. The paperweight was made for the Ulster Hospital and depicts a beautiful design of two children taken from a sculpture by Holywood artist Rosamond Praeger. This sculpture is in the Hospital. The paperweight stands 7cm tall. Fully stamped on the base and with original labels attached. He fit of the clock into the recess in the body is a little loose. It does make it easy to remove when changing the battery but it could have been snugger fit. Source : Sourced directly from the trade supplier. 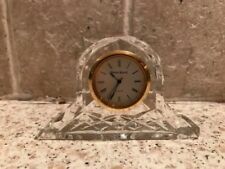 Large Tyrone Crystal Globe Excellent Condition. Here for sale a stunning Tyrone crystal globe. Standing 15" in height and sitting on a beautiful cut 5 1/4" base. Made by Tyrone Crystal. Tyrone Crystal ceased trading in 2010 when the factory in Dungannon closed. This is in super condition and has the Tyrone etched mark on bottom edge as photographed. I really would like collection only due to the item being fragile but would be willing to discuss shipping, collection and delivery prior to actually clicking on the buy it now button. Please see the many photographs on the listing. Not seen one of these before so willing to discuss price etc. Many thanks. Large bowl. Clonmel design. Stamped on base. This is a lovely Sugar Shaker made in Ireland by Tyrone Crystal. It is in very good condition and stamped underneath with the Tyrone Crystal backstamp. These are very collectable now that the Tyrone Crystal Factory is closed. The Glass does not seem to be signed but was bought from Tyrone Crystal. A super Tyrone Crystal lidded honey / preserve pot fully stamped on the base with the Tyrone backstamp. The jar is in excellent condition. TYRONE CRYSTAL PEN HOLDER/ PAPERWEIGHT IN VGC - NO BOX. BASE 3" DIA 1.3" DEEP - STAMPED TYRONE ON BASE. GOLD COLOURED HOLDER AND PEN WHICH IS IN WORKING ORDER. RARE TYRONE CRYSTAL FOOTBALL PAPERWEIGHT, TYRONE ETCH MARK / LABEL. This is a Lovely Cut Crystal Large DONAGHADEE Bowl which was made in Ireland by Tyrone Crystal. It is in very good condition and still has original Irish Handcrafted sticker on. These are very collectable now that the Tyrone Factory is closed. These are 2 lovely Cut Crystal Wine Glasses made by Tyrone Crystal in Ireland in the ROSSES Pattern. Very collectable now that the Tyrone Crystal Factory is closed. 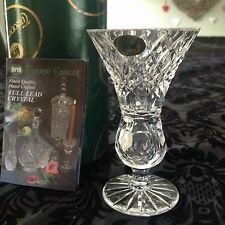 This is a lovely Cut Crystal Wine Glass made by Tyrone Crystal in Ireland in the ROSSES Pattern. It is in very good condition. Very collectable now that the Tyrone Crystal Factory is closed. This is a Lovely Cut Crystal Dublin Bowl & Lid which was made in Ireland by Tyrone Crystal. It is in very good condition Except for a tiny crack inside the rim of lid as shown in last photo. It is stamped underneath with the Tyrone Crystal backstamp. T his is a lovely Cut Crystal Bud Vase which was made in Ireland by Tyrone Crystal. It is in very good condition except for a very very tiny nibble on rim as shown in 2nd photo. It is stamped very faintly (hard to see). This is a lovely Wine Glass made in Ireland by TYRONE Crystal in the ROSSES Pattern. It is stamped underneath with the Tyrone Crystal Backstamp. This is a lovely Wine Glass made in Ireland by TYRONE Crystal in the ROSSES Pattern. It is stamped underneath with the Tyrone Crystal Backstamp and has the original Tyrone sticker on. This is a lovely Champagne / Dessert Saucer made in Ireland by TYRONE Crystal in the ROSSES Pattern. It is stamped underneath with the Tyrone Crystal Backstamp. Here We have a Lovely Tyrone Crystal Dalriada. Tyrone is one the very Best Crystal produced in the Republic of Ireland and is full lead Crystal.